When should you use ‘Avios and Money’? This article explains how the ‘Avios and Money’ feature of British Airways Executive Club works. Many people don’t realise that it can offer excellent value, letting you ‘buy’ Avios for as little as 0.77p. ‘Avios and Money’ is the feature of the Avios programme that allows you to book a reward seat for up to 65% fewer Avios than the headline mileage price. British Airways and Iberia Plus will, in effect, ‘sell’ you the extra miles you need during the redemption booking process. This may mean that a redemption you thought you couldn’t reach is in fact bookable. The official ba.com text on ‘Avios and Money’ is here – scroll down to the bottom where it says ‘Ways To Make Your Avios Stretch Further’. What are the key facts about ‘Avios and Money’? Everything you will read below only applies to redemption bookings and not for cash bookings. There is a similar scheme called ‘Part Pay With Avios’ for cash bookings. ‘Avios and Money’ cannot be used with a British Airways American Express 2-4-1 voucher. These bookings can only be made using ‘100% Avios’. You cannot change the operating carrier or route on an ‘Avios and Money’ booking – you would need to cancel the whole booking and rebook. ‘Avios and Money’ options are shown to you automatically during the booking process, so you can’t miss them. However, it is possible that you don’t do the maths properly and end up doing a bad deal. So good, in fact, that it may be worth using ‘Avios and Money’ even if you have enough Avios to book your flight outright. The odd combinations of Avios and money shown to you means that you might not realise what a good deal you are being offered. For long-haul economy / World Traveller redemptions, long-haul World Traveller Plus redemptions and all short-haul redemptions, it makes sense to pay more cash and use fewer Avios. It is the equivalent of ‘buying’ Avios for as little as 0.77p which is as cheap as you will ever see. 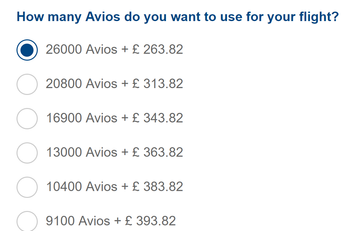 In the most extreme example, you pay an extra £130 cash in order to use 16,900 fewer Avios. That means you are effectively buying those 16,900 Avios for 0.77p each. This is a very good deal. Again, you are offered the chance to ‘buy’ Avios for 0.77p – up to 31,200 Avios in this case. Club World is ludicrously expensive. There is no reason for anyone to take advantage of this deal. Even in the unthinkable scenario that anyone was willing to pay 2.4p for an Avios they could buy them directly from BA for 1.6p. Here are two short-haul examples based on flying to Madrid. Using ‘Avios and Money’ works well on the Euro Traveller ticket but less well on Club Europe – although it is still worth considering. So, which of these options offers a good deal? There is, of course, no easy answer to that! This article attempts to put a figure on how YOU may value an Avios. There is no single answer that suits everyone. You need to consider that this is the purest ‘no effort required’ method of getting Avios. It would be totally reasonable for you to say that you would be happy to ‘pay’ 1p per Avios this way whilst you wouldn’t do any Tesco offer unless it came in at under 0.75p, for example. ‘Avios and Money’ has been expanded since it was initially launched, and now covers most of the oneworld airlines. The only exceptions are Japan Airlines and Russian domestic airline S7. You can also use ‘Avios and Money’ on redemptions with Aer Lingus, Alaska Airlines, Comair (South Africa) and SUN-AIR (Scandinavia). For reasons I do not fully understand, British Airways has more restrictive change rules in place for ‘Avios and Money’ bookings than for standard redemptions. You cannot change the operating carrier and you cannot change the route. You also cannot cancel one leg of a return flight – you need to cancel the entire flight and rebook, subject to availability, the leg you still want. So … if you booked American Airlines to New York and wanted to switch to a BA flight, it would not be allowed. (With a 100% Avios redemption, it is possible.) Similarly, you could not switch from New York to Boston. In both cases, you would have to cancel your booking and rebook. This could cause an issue if you only wanted to change one leg of your trip, as there is no guarantee that the other leg would still be available as a reward flight. 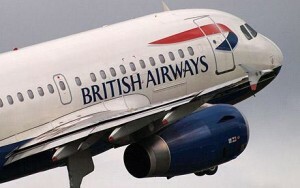 You cannot ring up BA after you have booked an ‘all Avios’ redemption and ask to switch the mix of ‘Avios and Money’. Next time you book a short-haul or an economy or World Traveller Plus long-haul Avios redemption, without using a 241 voucher, seriously consider taking advantage of this opportunity. They will be some of the easiest and cheapest Avios you will probably ever ‘purchase’. ‘Avios and Money’ is a surprisingly well-priced (in some circumstances) and useful tool which should be part of your Avios armoury. Rob, Can you still upgrade using Lloyd’s voucher after Avios and money option? No idea, sorry. It would be tricky because you are dealing with Club World taxes and WTP Avios. Note also that the 241 BA Amex voucher requires 100% Avios. I got some crazy value on a Cathay ticket. Needed two one ways for me and my partner from Hong Kong to shanghai and the cash price was near £600 total. Instead I was able to book two tickets for £150 and just 5000 Avios on my BAEC account. Madness. Amount of Avios and cash for WTP back from shanghai it was £700 and 31k Avios total for me and my partner. Or wildly off topic but does anyone know if PVG has somewhere you can securely store hold luggage for the day? In that case I can keep booking and meet up with a friend who lives in shanghai. Isn’t that the whole point here that miles let you save money, when the cash fares are expensive. If the fare was £300 I would have just paid cash and never even considered looking for award space as I would have been happy with that price. I guess value perceived is individual and everyone perceives it slightly differently as we all want different things. Yet you can’t value your avios at this high price since replacement cost is only about a penny (ie buy them for a penny if you don’t have them). But agreed, miles let you do things when prices are high / alternatives are inconvenient. We got 8p / avios on a Spanish domestic last year. I’d never have paid the cash price. Alternative was a 8 hour train journey or similar time drive so saved a day of our holiday. Because reward flights are very flexible, can be cancelled at low cost. Because of cashflow advantage. Sorry, it’s 8.30 on Sunday and my brain is a bit slow. I’m looking to book a OW flight to Prague in business. The cash fare is a ridiculous £533 which I would never pay. A flight with Ryanair for the same date and around the same time is £70. My instinct is to go for the 5000+ £70 or is this terrible value? Any of those BA choices are pretty good value on several scores, incl vs the scrum of Ryanair & (on BA) superior airport/ lounge access, 2x 32kg checked luggage included/ drinks & snack on board/ priority boarding/ headline saving vs cash. Rule of thumb is Avios are worth 1p so you’re paying £115-120. I’d probably go for the 9000 + £25 in this instance but there’s not too much in it, partly depends if you’d rather preserve Avios stash (at a cost) or not. OTOH on such a short flight I’d always go for an Economy reward flight if available which I guess is 4500 Avios + £17.50 (with checked luggage included) – so easily beats Ryanair and is more directly comparable (compared to Business BA vs LCC Ryanair). Another consideration is the Prague flight departs LHR T3 so with the Business ticket you could do a tour of several decent lounges (for free) including BA, Cathay Pacific, Qantas – if arriving 3 hrs before your flight and making the most of some great lounges appeals to you, you could get decent value out of the extra cost vs Ryanair ticket (or BA Economy). Didn’t realise that about the various lounges. Thank you! £45 for 4000 Avios is a bad deal. Pay 9000 – unless you are fairly low on Avios.